But just in case you haven’t heard of Alice Randall…allow me to do the honors. Alice Randall is the first African American Woman to write a number one country song, she is also Jamie Oliver’s Food Revolution Nashville Ambassador, and has been recognized by the National Institutes of Health as a Health Champion, she is a screen writer, and an author... A New York Times bestselling Author to be exact. And Alice Randall has returned to the literary world with her daughter Caroline Randall Williams for a second time with their new cookbook “SOUL FOOD Love” and with a title like that…what better time for this cookbook to make its debut… but in the month of February… the month synonymous with love…the month of Valentine’s Day…the month of Black History. SOUL FOOD Love is not your ordinary cookbook…it’s a love story…a love story paying homage to three generations and five kitchens. The recipes tell a story of love, family, culture, tradition, history, and the joys and pains of being a woman in Black America. The authors give us a unique opportunity to travel back in time as they trace their family culinary tree. As spectators we see that each kitchen created a tapestry that created the very fabric that resulted in the recipes in this cookbook. The Mother and Daughter duo has taken traditional recipes that has been passed down from generation to generation and created healthier versions. 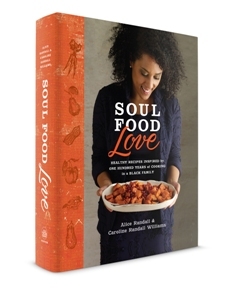 SOUL FOOD Love is one of those cookbooks that you have to take to the living room and read cover to cover to really appreciate the stories and the 80 recipes… before taking it to the kitchen. The family photographs, along with the amazing food photography, makes you feel like you’re sitting at the table with a long lost relative at a family reunion. I especially appreciated the story and the recipe of Dear’s Sweet Forgiveness. Actually there were a few recipes I couldn’t wait to dive into, and who can blame me with such amazing food photography…and the results… Amazing! However “Dear Sweet Forgiveness” was my favorite story, making the recipe that goes with it unforgettable. I would love to tell you the story but I don’t want to spoil it for you because I know this is definitely a cookbook you will want to add to your collection. I think this cookbook is a must have for any cook who is looking for a healthier alternative to cooking soul food. The recipes were definitely versatile enough to please any vegan, vegetarian, and our meat lover in your family. The recipes were easy to follow, the ingredients were easily accessible at my local farmers market and supermarket, and the recipes were absolutely… Delicious. This is a cookbook that I highly recommend if you want to start off your New Year with some healthy and affordable recipes. 12 fresh raspberries, blueberries, or Clementine pieces. Put 1 piece of fruit in each compartment of a 12-slot ice cube tray, fill with water, and freeze until solid. In a rocks or old fashioned glass, pour the elderflower liqueur over the ice cubes, and top off with the sparkling water.